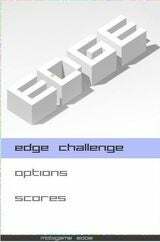 Edge, the iPhone game that kicked off the latest and nastiest battle over over trademark rights to the word in video games, is back up on the iTunes App Store as "Edge by Mobigame." Mobigame rebranded the game in the United States and United Kingdom markets specifically to neutralize any claim Tim Langdell's Edge Games - notorious for challenging any use of the word "Edge" by video game developers - might make against the game. A news release from Mobigame stressed that no agreement or settlement had been reached with Langdell. The game was originally available as EDGE on the App Store in the U.S. and U.K. from March to about May. Its takedown was largely attributed to Langdell, although he says Mobigame itself asked Apple to remove the application in light of the legal dispute. "We renamed to 'Edge by Mobigame' for the U.S and the U.K market only to have the approval from Apple (and we have it now)," Mobigame's David Papazian told Kotaku. "On the legal side, he cannot claim anything against "Edge by Mobigame" and Apple knows that, so we hope everything will be alright now." Papazian expressed confidence that Electronic Arts will prevail in its recent appeal for the U.S. Patent and Trademark Office to cancel five Edge-related trademarks held by Langdell, on grounds they both have been abandoned and were fraudulently obtained. EA's suit arises from a dispute over its 2008 title "Mirror's Edge." Langdell vehemently disputes EA's claims.